The New England Eye Center is a specialty care practice – that is, primary care doctors refer cases to specialists for treatment. The Eye Center builds relations with primary eye care doctors and general practitioners in communities around eastern and central New England. They use a variety of items to market themselves – from pens and calendars to a complete "referral guidebook" that lists all the specialties, services and physicians available with full contact information. 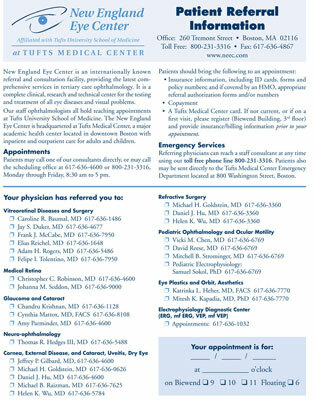 In addition, the practice produces pads of referral sheets to make it easy for a local doctor to direct a patient to a New England Eye Center specialist. 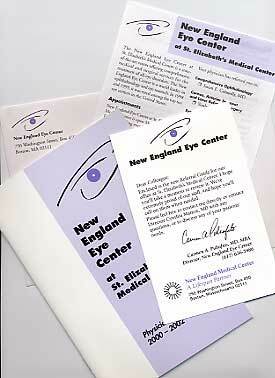 We've been working for the Eye Center for most of its 16 years and have evolved the referral materials to be very efficient, including the pad above that features maps and directions on the back for patients to use to find their way to the Boston offices in the Theatre District at Tufts Medical Center. Below you can see the smaller referral guides and pads we did for the smaller, satellite offices throughout eastern Mass. These promoted the physicians and services available at the local offices. The kits contained a booklet with profiles of the physicians that served the office. It also contained a pad of referral sheets for physicians to give their patients with maps and appointment information. These were produced as 8-, 12-, and 16-page booklets, and mailed with Rolodex cards and referral note pads. The materials went out with a small "tip-on" card (vs. a letter) for quick and affordable communication with busy colleagues who might refer patients.